Pink boxing gloves, by Everlast, are the most popular choice of womens boxing gloves for a boxing cardio workout. Boxing gloves for women should fit comfortably and offer good protection. Everlast gets it right on both counts. The pink Everlast Women's Pro Style Training Gloves have been a best-seller since they hit the market. Stylish, comfortable, and built with the Everlast detail to durability, these ladies' boxing gloves are protective enough for sparring, although 99% of women use them for a boxing cardio workout. What makes The Pink Boxing Gloves so popular with women? Most of the ladies I know have opted for the 14oz glove. They use them in cardio kickboxing classes and swear by them. Most have also purchased the Pink Everlast Hand Wraps for more protection from friction on their knuckles. They are very inexpensive. 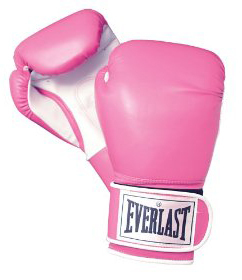 The Pink Everlast boxing gloves continue to grow in popularity. What other piece of equipment could make such a solid statement for toughness, fitness, and femininity?